Protect several of your hanging hummingbird feeders from ants using these Audubon Red DefendANT Ant Guards. 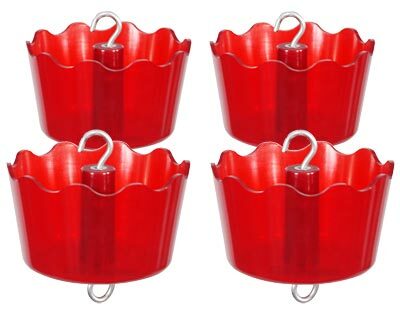 These four, classic moats create a barrier between your bracket and hanging nectar feeder, while the red color of each enhances your setting. The scalloped top rim of each evokes a flower, and a metal hanger on the top and base attach to your feeder and a hook with ease. Fill each plastic reservoir with 5 ounces of water to act as a natural deterrent for crawling insects. As ants and other insects are often hesitant to cross bodies of water, this offers a convenient and safe way to keep them away from nectar. Ensure your hummingbird feeders remain free of crawling insects with these Red DefendANT Ant Guards. Note: This case pack includes 4 of the Audubon DefendANT Ant Guards, Red.